To protect the device, it can bend much easier than aluminum pins. BLTouch is an auto leveling sensor for 3D Printers based on open-source. It could work with any kinds of bed materials, such as glasses, woods, metals, and so on. BLTouch is noiseless on the standby phase. Moreover, BLTouch makes even a small click sound instead of the Servo Motors’ irritating loud noise while the push pin is moving. You can see that in the video. Compared to most of the Servo Motors, BLTouch is free from frequent breakdown. BLTouch consists of Atmel ATtiny13A, solenoid, and a push pin. 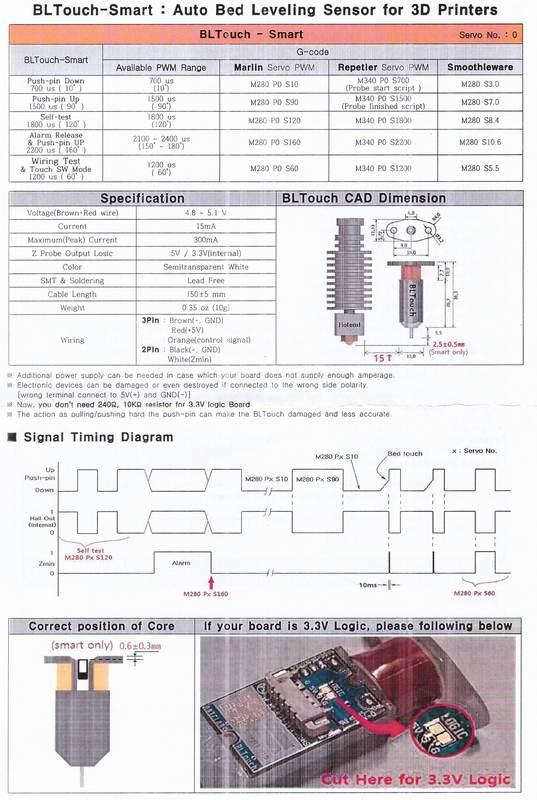 BLTouch uses the same servo signal which used in previous servo line. ➡ Not optical, either proximity(inductive or capacitive) one.